On a recent project I was working on an Intranet which had the publishing infrastructure feature enabled. I was working on setting up some pages and configuring web parts when I noticed an error on saving or checking in a page, see figure 1 below. The URL ‘Pages/default.aspx’ is invalid. It may refer to a nonexistent file or folder, or refer to a valid file or folder that is not in the current Web. 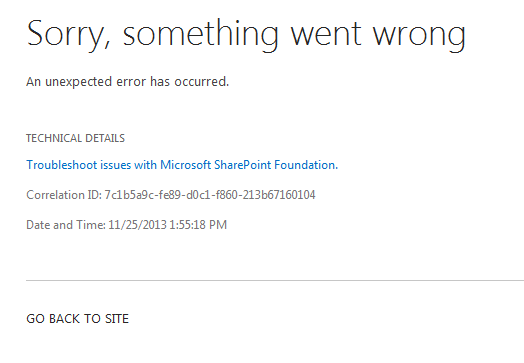 As with most errors in SharePoint I cracked opened the ULS logs. Its slightly more difficult to find relevant data in the ULS logs without a correlation ID but after searching for the error text I was able to locate the ULS details for the page request. Unfortunately there was no further details around what was causing the error. I then turned to Google and had a look for the error message. I found quite a few articles but pretty much all of these related to database issues. Most talk was about space on the database server or databases being read-only, however none of this was relevant to me. At this point I couldn’t find any details in the ULS logs or online so I decided to start stripping back my solution component by component to see at which point the error occurred. While the site was still in development there were a lot of steps to replicate. I started by spinning up a new web application and then applying the changes one by one. After each change I was creating a new page and editing an existing page to test if the site was broken. In the end it turns out the issue was a PowerShell script which was being run to create some site columns. This had been created to quickly provision site columns which are commonly used across most projects. Once I had identified the source of the issue I then had to figure out if it was a particular site column which was causing the issue. I started commenting out sections of the script and I was able to narrow it down to a particular column. The problematic site column was a calculated column and as soon as I commented this out and deleted the column the site started to work again. I’m not sure why this was causing an issue but it can be easily created manually so i removed it from my script. Hopefully this helps others as all the articles I found online all pointed to a database issues so keep in mind it could be a corrupted site column as well. While working on a recent project I was navigating our development site and when I tried to edit a page I got the standard SharePoint error screen, see figure 1. There was very little customisations on the site as it was still in the earlier stages of the development process so I was slightly confused as to what the issue could be. As with most SharePoint errors the easiest way to get to the bottom of the issue is to check the ULS logs so I copied the correlation ID and opened up ULS Viewer on the server. I opened the latest ULS log file and filtered by the correlation ID. Looking through the log file I finally found the details of the error, see Figure 2. Looking over the details it wasn’t obvious what the actual error was but it seemed to point to an issue with the page layouts so I decided to review all custom ones to see if there was anything obviously wrong. I opened the site in the browser and navigated to the master page gallery. When I tried to edit one of the custom page layouts I got an error, see figure 3. The error seemed to be highlighting an issue with the content type the page layout was associated with so I returned to the master page gallery and hovered over the associated content type link, see RHS column on Figure 4, and I could see the URL on the bottom of the page was “_layouts/15/ManageContentType.aspx?ctype=#VALUE!” whereas it should contain the ID of the content type. Normally this would not be an issue with page layouts uploaded via the browser or SharePoint designer, however in my case the custom page layouts had been uploaded into SharePoint via PowerShell. I checked the PowerShell script and I could see the original version uploaded a page layout into the correct location, however it was setting the associated content type property of the page layout to be a string, see figure 5. I knew from previous experience this needed to be a concatenated string but I couldn’t remember the exact format so I quickly put together a test script which got the value of an OOTB page layout. Using this script I could see the value actually had to be a concatenated string of the content type name and ID, see figure 6 for updated PowerShell. As the site was still in the early stages of development I was able to easily delete all pages which used the custom page layouts, delete the page layouts and re-upload them with the corrected script. I then double checked the associated content link in the master page gallery, see figure 7, and it was correctly populated. After that I was able to edit pages and content within the site. Hopefully this saves some other people some time and I suppose the key lesson would be, as always, be careful with PowerShell and double check its actually doing what you expect. While working on a recent project I noticed some strange issues with a managed metadata column in a list. I had created a custom list and I was populating this list with user profiles in SharePoint. The idea being certain users could view and update user profile information without having to have access to central admin. To achieve this I had a scheduled task which pulled the information into the list and an event receiver which updated the data back into the user profile when an item was updated. This was all working fine, except I started to notice some of the data in the managed metadata column wasn’t correct. My first thought was the code was inputting incorrect data but I ran through the code and it was all working as expected. Things got stranger still when I noticed that if you were on the list view or viewing an individual record the data was incorrect, however if you were editing an item the data was correct. Having ruled out the code I then compared the options available in the term store on the site and also when editing a user profile in central admin. It was at this point I noticed these options were slightly different. From previously working with the manage metadata service I knew there was a hidden taxonomy list stored at the root of each site collection, rough URL http://SharePointSite/Lists/TaxonomyHiddenList/AllItems.aspx, so I checked this as well and it contained old values so this lead me to believe it was a synchronization issue. As with almost all problems these days I fired up PowerGUI and Google and within a few minutes I had generated the function below so I could re-use this again if need, see figure 1 below. Write-Host "Unable to find site with URL $SiteURL"
I hope this helps others as when I had a look around there was nothing I could see on this issue. One of the most recent projects I have been working on is a SharePoint 2013 public facing web site. The site has been live for a while but the client recently reported the search results were not returning in the order they expected. I checked the search results page and it was sorting by rank so I decided I should invest some time looking at how the SharePoint ranking model works and what I can do to impact this. While there is a lot of information out there I found it difficult to grasp how all these factors were combining in my environment, especially when things like number of page clicks can influence the ranking. After some further research I found a link by Waldek Mastykarz Understanding item ranking in SharePoint 2013 Search. This is an excellent article which documents this very useful feature, however when I tried to access this on my environment I got an error, see figure 1. I had a check on the site and I was a site collection admin so next I opened central admin and navigated to the service application list. 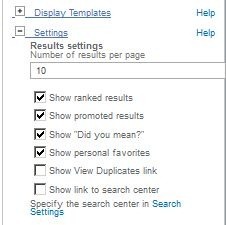 Once there I selected my search service application by clicking next to the name, see figure 3. While working on a few SharePoint 2013 projects I have been utilising the SharePoint search in a lot of places to provide dynamic content and there has been quite a few occassions when things don’t seem to work as expected such as CBS Server Side Date Error or Results web part ordering. I suppose this is to be expected when the search engine has been completely replaced with a mix of the old SharePoint search engine and FAST search. When working on one aspect of a recent project I was using the results script web part to query some events stored in a list. As per you would expect these events had the typical details such as title, date, description, etc. At first everything seemed to be working as expected until the client reported there was a bunch of events missing from the search generated list. My first thought was these were new events and weren’t in the search index so I kicked off a full crawl. Once this was completed I checked the site and the events were still missing. Next I looked at my query to see if there was something wrong with it. For example I was filtering out all past events and restricting the search results to the events content type but everything seemed ok. I spent some time looking around and eventually I noticed that the missing items were very similar to other items which were getting displayed in the search list. There would be 4/5 events in the list with the same title and description but with different dates or locations. I had a look at the web part properties and I noticed there was an option to show a link to display duplicate results, see figure 1. I selected this option but it never done anything. From previous experience with some web parts I knew there are sometimes web part properties which are not exposed via the UI which can still be set if you export the web part, a good example of this is to get the Content By Search web part to run server side. I exported the web part and opened this with notepad and searched for “Duplicate”. Wouldn’t you know it there was a boolean flag in the DataProviderJSON property called TrimDuplicates and this is defaulted to true, see snippet below in figure 2. Most of the snippet above is default settings which you can ignore the import one is TrimDuplicates. In my case as soon as I set the this to false, saved the web part, imported it into the web part gallery and added it to a page all my results started to display correctly. The key element here is how SharePoint determines if items are duplicates and in my case I suppose it’s fair enough as most of the key information such as the title and description were pretty much exactly the same. This is another classic example of SharePoint and how its working as expected but because there are 101 configuration options you are not getting the results expected. It’s important to fully understand the product and all the options and what it can offer. This is one I will not forget and hopefully it provides a prompt for others in a similar situation. While working on my most recent project I have spent a lot of time using the user profile service and while it offers some real benefits I have found it can be difficult to troubleshoot, especially when it comes to synchronizing with external sources like active directory (AD). After configuring the user profile service on the client’s live environment I noticed that the email and manager fields were missing for some users. I wanted to try and get an idea of the extent of the issue so I went to the manage user profiles screen in central admin (CA) and while its useful for finding individual users its doesn’t really help view certain properties for all users. Thinking about the options available I knew from previous experience I could write some C# code to get this information but I have been making an effort to brush up on my PowerShell (PS) skills so I decided this would be a perfect opportunity. As with all PS scripts its essential these are first tested in a development environment before run on live. I began by creating my PS script on my development environment using PowerGUI as I think this is an excellent tool which makes creating PS scripts much easier. I then started working on each step and finally put it all together. Each of the steps is detailed below. Write-Host "Unable to access site " $SiteURL " please ensure the URL is correct and you have access to this"
Once I had the service context the next step is to get the user profile manager which is done by creating a new UserProfileManager instance passing in the associated service context. Write-Host "User Profile Manager does NOT exist"
With the instance of the user profile manager I then got all users by calling the GetEnumerator method. In my situation there were hundreds of users so I decided outputting the information to the PS console would be difficult to read of I decided to output the details to a text file instead. Write-Host "Property $UserProperty doesn't exist"
Putting all the above steps together adding additional logging, variable checks and ensuring all settings can be passed in I ended up with the function below. Write-Host "Please ensure all parameters are supplied"
Write-Host "Starting to get all user profiles"
Write-Host "Please supply the site URL the User Profile service application is assocaited with"
Write-Host "Got User Profile Manager "
Write-Host "There are " $userProfileManager.Count " user profiles starting to loop through them. The results will be output to specified text file"
I have already used this function several times without any issues and I have found it a very easy and flexible way to pull information from the user profile store. I hope this is helpful for others too. One of the most interesting new features in SharePoint 2013 is the changes to My Sites and the improvements to the social features such as the newsfeed, communities, hashtags, etc. In order to get up to speed I have spent some time looking at what’s new and how we can use this to help our clients. As part of this a test environment was configured as a playground but when I came to test the hashtag functionality, see figure 1, it gave and an error saying the tagging service was unavailable, see figure 2. I checked all the services and everything seemed fine, so I checked all the event logs and ULS logs. I came across one error in the ULS logs, see below. From my research into the new social features I knew there was a MicroFeed list which stored some of the content so my initial impression was the HashTags column may have been missing from this list, however when I checked the list I found the column was there. After some further research I found an article which explained that the hashtags and keywords were partially stored in the Managed Metadata Service so I decided to focus my attention on this. I had already checked the service had been created and it was associated with the web application. In addition I knew I could access it from Central Admin so I checked accessing the term store from within the site collection. While I was able to access the term store I could see the hashtags and keywords term sets were empty, see figure 3. From previous experience with using the term store to generate the navigation in another project I knew that even if the Managed Metadata Service is associated with the web application and term store is accessible from within the site collection it still needs to be set as the default for the web application. I checked this by logging into Central Administration going to manage service applications and locating my Managed Metadata Service in the list. To set the service as the default you need to click on the proxy service, see figure 4, and click properties in the ribbon. This will launch a popup and the top two check boxes need to be selected, see figure 5. As soon as I changed this the hashtag functionality started to work, see figure 6. 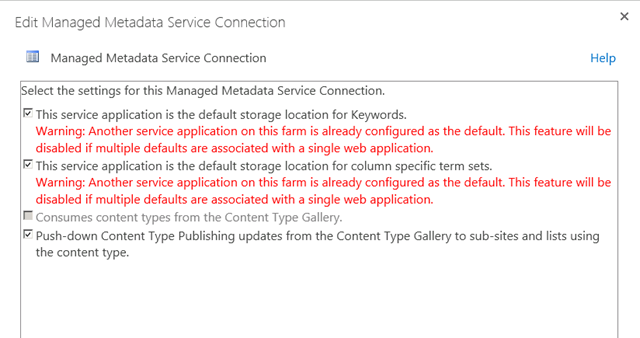 One thing to note is you have to be careful when setting the Managed Metadata Service to be the default as if you have multiple Managed Metadata Services associated with the one web application it can cause some issues.